Winners all round at Read for My School! Winning pupils at Blessed Edward Oldcorne Catholic College – congrats! Today we’ve got a very special guest post from one of our most supportive readers: Linda Bromyard, school librarian at Blessed Edward Oldcorne in Worcester! I first found out about “Read for my School” right here on the fabulous “Girls Heart Books” site! I investigated more about Read for My School, and signed up to join in with thousands of other schools all over the country. 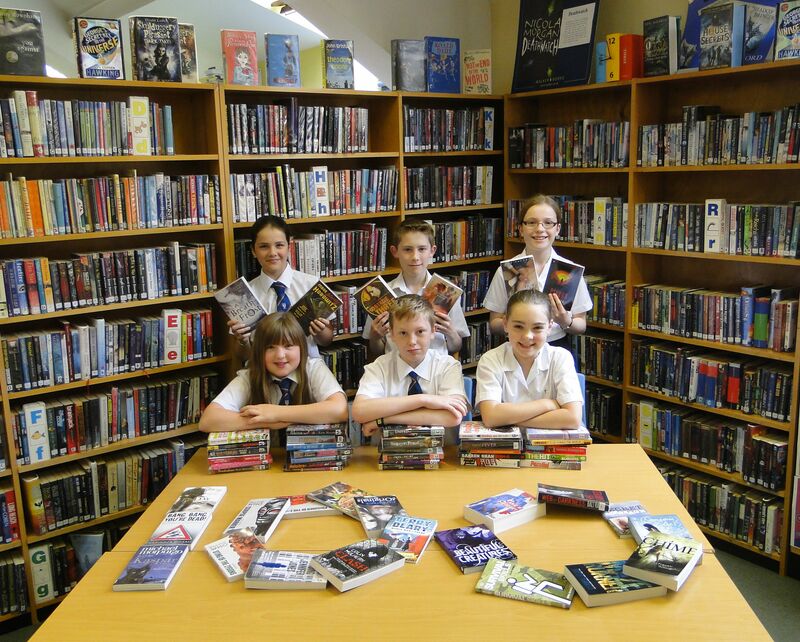 It is a national competition from the Pearson Foundation and Booktrust, with support from the Department of Education. Reading for pleasure is the main aim of the competition, while also generating excitement about books. Students are challenged to read as much as they can over two months in the spring term. They have free access to over 100 online books, with the opportunity to win prizes for themselves and also books for their own school/college. Students from Blessed Edward Oldcorne Catholic College were invited to join the challenge, with over 60 regularly signing into the site. Books could be read online, or students could choose to read a paper copy or on an e-reader. I was thrilled to see so many students taking part, and totally engrossed with reading. The scheme has definitely had a positive effect on the students, helping them to discover the on-line books, and immerse themselves in reading for pleasure. They were delighted to find that all sorts of books were accessible, for both enthusiastic and reluctant readers. Congratulations to our students, too, as they were rewarded at the end of the scheme, as our College has been selected to win 100 books for the College Library! Thank you to everyone who participated. We are looking forward to taking part again in 2015! Linda, we’re so delighted for you and your students – congratulations! And we’re extra chuffed that you discovered Read for my School right here on GHB! We’ll do our best to keep bringing cool stuff to our pages! Any other GHB readers been taking part in this brilliant initiative? What fab books have YOU all been reading recently? Tags: Booktrust, Linda Bromyard, Pearson, Read for my School, winners. Bookmark the permalink. Previous post ← Patron of Reading – Would Your School Like One? Great to hear how popular the Read For My School initiative was at your school, Linda. (And glad you were spurred on by my initial post about it!) Coincidentally, this very morning I was presenting the Read For My School trophy to the school whose students read the MOST books during the course of the challenge. I was absolutely delighted to find out that I’d be going to Lordship Lane School in Wood Green – I visited them on World Book Day this year! (Yup, another coincidence!) Together they read a staggering 10,160 books. I had to read that figure about three times before I took it in! So hurrah for Read For My School and all everyone who participated this year. All reading stars! BTW you can check out some photos of the event @KarenMcCombie on Twitter!